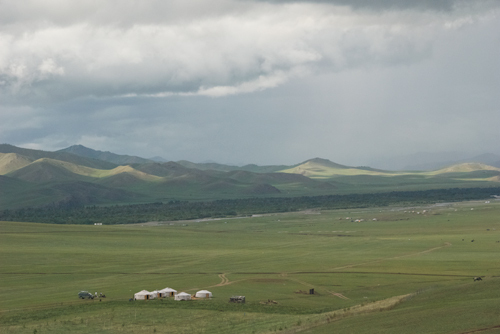 The only thing many people know about Mongolia is that it is the place from which Chinggis Khan and the Mongol Horde rode forth to conquer the largest land empire in history. The Mongols’ view of him is very different than the one westerners grew up with. Far from being a bloodthirsty “barbarian”, he is considered more as Americans do George Washington, as the father of their country. He united the Mongol tribes in 1206. The last vestiges of his empire lasted until the 18th century, although it had split into many separate parts long before. He was their lawgiver and his pronouncements carry weight and provide some guidance in the country to this day. Mongolia became the world’s second communist country in 1921. Not long after, the memory and public acknowledgment of Chinggis Khan was, except for a very few brief periods, actively suppressed. This changed, it appears, almost instantly, when Mongolia became a democracy in 1990. He is THE major cultural icon of Mongolia today. In fact, I just realized that I’m writing this wearing my Chinggis Khan t-shirt that I bought when I was there in 2006. There is also Chinggis Khan beer and vodka. Large wall-hangings with his portrait are very popular. You see him on billboards. He and his warriors ride into the National Naadam stadium during the opening ceremonies. There is a pop singer named Chinggis Khan. And, as you will see below, one can put together quite an interesting tour of the country visiting statues, monuments and a variety of locations associated with him. I’ve been to three of the ones listed here and hope to visit the others at some point. Who knows, maybe this summer! 1. Sukhbaatar Square- When I first saw the Government Building in 2005, it was a socialist era plain brown rectangle. The next time, in 2006, it was covered with scaffolding and it looked like a major change in the facade was under way. By the time I saw it again in 2008, the transformation was complete as you can see in the first image. It’s now one of my favorite government buildings ever. 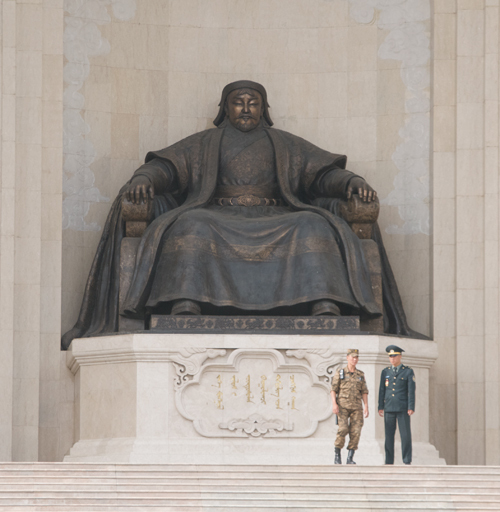 And the centerpiece is an enormous statue of Chinggis Khan. 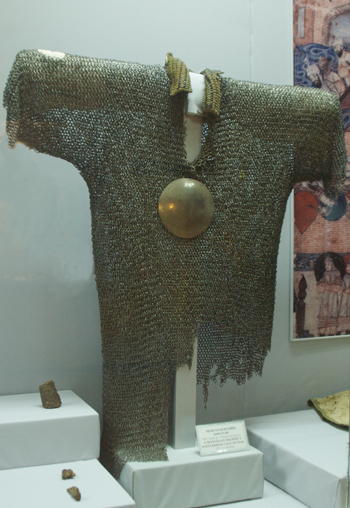 Mongol chain mail hauberk-13th-14th c.
2. 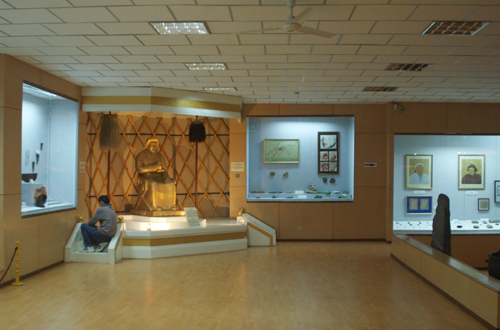 National Museum of Mongolian History- There’s a rather large room devoted to Chinggis Khan and the Mongol Empire on the 3rd floor. Lots of interesting artifacts, including the chain mail hauberk show above. There are supposed portraits of Chinggis, Kublai and other Mongol khans, but I believe they are Chinese in origin and created after the lifetimes of the subjects. One unexpected display has an actual letter between one of the later Khans, Guyuk, and the Pope. There was a surprising amount of communication between the Mongols and western Europeans from the 13th century on, although usually at cross-purposes. The Europeans wanted the Mongols to help them beat the Saracens and the Mongols wanted the Europeans to submit to them and become part of the Empire. Needless to say, neither party got what they wanted. 3. 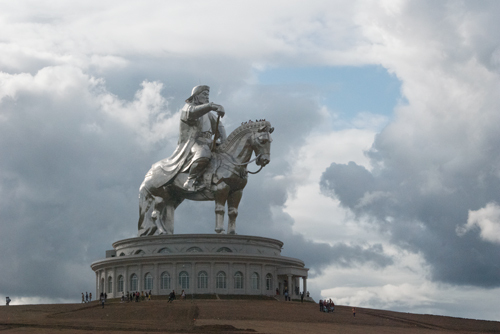 The Chinggis Khan Equestrian Statue- It’s 40 meters high and on a 10 meter high base and is covered in aluminum. If you look at the horse’s mane, you can see the people who had taken the elevator up into the horse’s body. There’s a restaurant, gift shop and other facilities in the base. The second image shows what the statue “sees”. Out beyond those mountains is the origin point of the Khalkha Mongol people, who westerners think of as “Mongols”, although there are quite a few other ethnic Mongol groups. These next three are the places that I haven’t been to yet, so there’s no images. 4. The Onon River– In the mountains near this river’s junction with another, Balj Gols, is where Chinggis Khan is believed to have been born. Although westerners think of the Mongols as a steppe people, they originated in a mountainous area that is part of the southernmost extension of the taiga or boreal forest. This is where the first monument to Chinggis Khan was erected during the socialist era. The people responsible ended up being purged. There is also a stone marker near the village of Dadal, placed in 1990 to commemorate the 750th anniversary of the writing of the Secret History of the Mongols, almost the only primary reference material available about the Mongols during the time of Chinggis Khan, although it survived only as a Chinese transliteration. 5. Avarga- This site on the Kherlen River is supposed to be the location of Chinggis Khan’s “capital”. It is believed to have served as his base from 1197 until the end of his life. I’ve been told that there are two noisy ger camps in the immediate vicinity, so it looks like a day trip or camping out will be the preferred options. 6. Burkhan Khaldun- This mountain, where Chinggis Khan took refuge from enemies before he became Khan of all the Mongols and journeyed at various times in his life to pray to Tenger (the Sky), is located within the Khan Khentii Strictly Protected Area, which the Lonely Planet guide describes as “Chinggis Khan territory”. There is an ovoo on the mountaintop that is visited by the Mongols. I don’t know if it’s ok for non-Mongols to go onto the mountain, but I would at least like to see it. I’m Featured In Wildlife Art Journal! Plus Here’s My Latest Painting. That equestrian statue — just WOW. Especially the view — so evocative. Have you seen the movie “Mongol”? It’s made by Mongolians, in the Mongolian language, and it recounts the early history of Chinggis Khaan. Impressive leader. No, I haven’t seen the Mongol’s own version yet. I’d certainly like to. It hasn’t shown up in the US that I’ve been able to find yet. I’ve got the Sergey Bodrov film “Mongol”, which was nominated for the Best Foreign Film Oscar. The Mongols I’ve spoken with about it seem to hate it, but other than casting a Japanese guy as Chinggis, I thought it was pretty balanced and well-done. And it was successful enough that part two is supposed to be in production. Yes, he was a very impressive leader. The world could use someone with his tolerance and breadth of vision today. Actually, his leadership style is still appreciated today by many. Are you familiar with the book “The Management Secrets of Ghengis Khan”? It came out a few years ago, but was very successful, because people realized that the man’s genius was in getting very different groups to work together toward a common goal. I think I remember hearing about it but I haven’t read it. If one doesn’t know any of the facts about Chinggis Khan, the title sounds gimmicky. But I’ll keep an eye out for it and snag a copy. It’s probably available on Amazon. It’s out of print, but they do have copies available starting at around $18. The title is “Leadership Secrets of Genghis Khan” and it’s by John Man, who also wrote “Genghis Khan: His Life, Death and Resurrection”. and Genghis Khan was very smart i think.